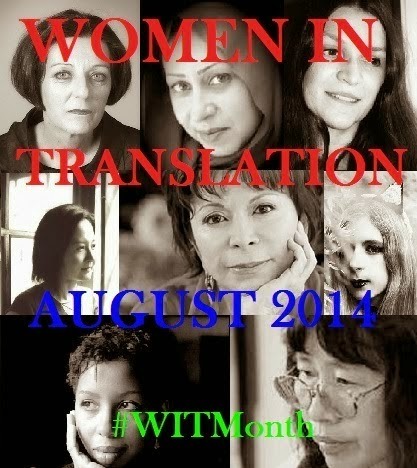 While Women in Translation Month is all about highlighting the overlooked, it’s also nice to celebrate those female writers who have already managed to become well known in the Anglosphere. Of course, if you’re looking for big-name female writers in translation, nobody quite seems to have captured attention over the past year or so like Elena Ferrante, the elusive, reclusive Italian writer whose Neapolitan Novels have impressed so many readers. Those Who Leave and Those Who Stay (translated by Ann Goldstein, e-copy supplied by Europa Editions) continues seamlessly from The Story of a New Name, with Lenù introducing her new novel at a bookshop. When a middle-aged man is less than complimentary about her work, she‘s taken aback, so it’s fortunate that a white knight appears to defend her – none other than Nino Sarratore, her childhood friend (and crush…). Outside Lenù’s apartment, though, things are a little less sedate. This is the late sixties, a time of unrest throughout Europe, and students are rioting in the hope of creating a new world order. In these tempestuous times, especially in the universities, there is a real sense of danger, from which Pietro is certainly not exempt (he’s not exactly a man of the new era…). While her next book is a bit of a struggle, Lenù is able to dabble in journalism, tempted into becoming a voice of the people. This is largely absent here as the two women go about their separate lives, and even when they do meet, it’s usually in the presence of others, and the expected confrontation is avoided. Several times the tension builds to what we think will be a dramatic scene, only for the emotions to ebb away without ever coming to the boil. Why? Well, throughout the second half of the book, she shows herself to be selfish, lazy and aggressive, in addition to being annoyingly passive when she should be getting things done. The story is basically setting up Nino’s return, and this means that poor Pietro is in for some pretty shoddy treatment. I actually thought that for much of this book, a view through the husband’s eyes would have been much more interesting, looking at the friends and their families with the eyes of an outsider. Perhaps we’d see Lenù then in a very different light. Again, I hasten to assure you all that I did enjoy the book, and I do think it’s worth reading. However, it’s not a book that can really be enjoyed without having read the previous two novels first, and I still believe that it doesn’t quite match up to those. Having said that, I suspect that my doubts will be set against a tidal wave of support for the book when other reviews start coming in. One of the key ideas of the novel is the frustration Lenù feels at being stuck at homewith the children, having to put her career on hold while she sacrifices herself for her family, and I suspect that this aspect of the story will be appreciated far more by other readers. Ferrante's art is primarily psychological, I take it? Character based? I have not seen anyone quote a single interesting sentence from her books. You have done a great job, by the way, in avoiding the poisonous Ferrante-reviewing cliches. No, I was wrong, the sentence about invisible animals has some juice. “I suspect that my doubts will be set against a tidal wave of support for the book when other reviews start coming in.” That's what I expect too, but you can set your doubts against mine and we'll hold it off! Tom, there are certainly interesting sentences, but for me it's hard to know if I can credit or blame her or her translator for specific stylistic things. I conferred with an Italian friend who has read the books in both languages and she thinks the translations really flatten out Ferrante's cadences and idiom. Did I ever botch that link – I was trying to get to Rohan's review! Which I see on Twitter you have already discovered. Tom – Definitely psychological and character based – the beauty of the first two books was the creation of this not-quite-right link between the two women, a poisonous relationship which made Lenù a nervous wreck at times. This one separated the two and didn't really supply much to fill the gap. It's not bad, though, merely not great, and I'm still keen to try the last part (when it arrives in English…). Rohan – A lot would depend on dialect v standard Italian, and Goldstein can't really do a lot here except state “and I said in Italian…”. I think this one is a little flatter than the first two anyway; certainly, the energy of those (and 'The Days of Abandonment') was largely absent here. Stu – Ah, the Ferrante backlash has begun! Rohan (above) has written a great piece on the need to look more closely at Ferrante's work and get beyond the idea of female anger, and I suspect that this may be about to happen. Still enjoyed it, though. It sounds as if we had similar reactions to this one, Tony. I found it quite a difficult book to review, primarily because it's third instalment in one long narrative, and it's hard to do so without revealing key elements of the whole story. You've made a great job of it though, much better than my sketchy impressions. I, too, missed some of the spark that stems from the interactions between Elena and Lila (along with the hustle and passion of life in the neighbourhood). I'm very intrigued to see what happens in book four, though; I'm anticipating (and hoping for) a fiery final chapter.